This entry was posted in Tossman Cryptic Crossword Solutions and tagged answer, crossword, cryptic, solution, tossman on January 27, 2017 by pavlov.a. 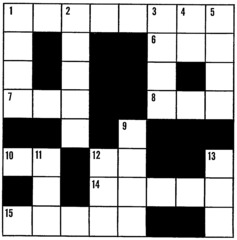 I enjoy your crosswords – thank you. I have two book with crosswords compiled by you. Great fun. Thanks for the comment, Jennie – I’m not the compiler, but let’s hope Tossman sees this comment!